One of my favorite ways to use Design Studio is as a "planner" to create cards and page layouts virtually before I cut (and potentially waste) my paper. I was thinking about an idea for a Valentine's Day card tonight and here is my current "take" on the card. Of course, there will most likely be some "bling" added to the final product! 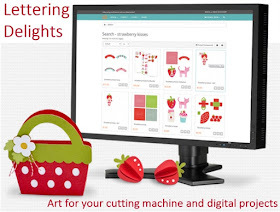 Sometimes new users of Design Studio are confused about how to use the preview function to show a design as they have imagined it. I thought I'd make sure you know a few things that may or may not be "old news" but are good reminders on a helpful way to use the program. First, in order for a color to show in preview, the item can not be welded. 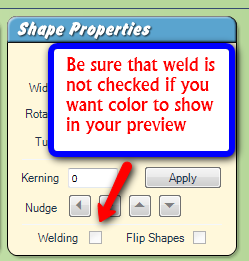 This does not mean that you can't weld the items together for your actual cut, but if you want to preview the design in color you will need to "uncheck" the weld box for each item. In order to make things simpler, I often include two mat pages in the file - one marked CUT for the actual welded pieces and one marked PREVIEW ONLY to use for the color options. In this particular file, I used a prewelded word so I didn't need to create an extra mat. 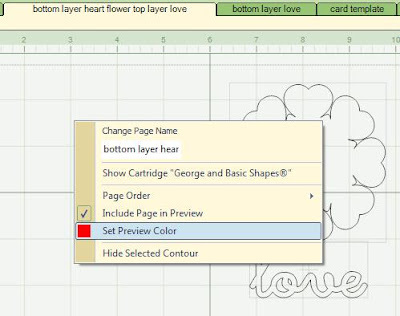 Next, you need to think about the layers from the top down which is the way the program will build the preview. In other words, the items on the first mat should be those that will be the top layer of the card. Depending on the way you plan to layer the items, you may need to make multiple mats that will preview in the same color. If you click on this image to enlarge it you can see that I have seven mats in the file. The first mat is for the tiny heart in the center of the heart medallion and is set to preview in red. 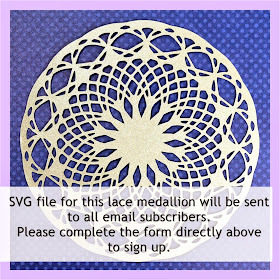 The next mat is for the top layer of the medallion and is set to preview in dark pink. 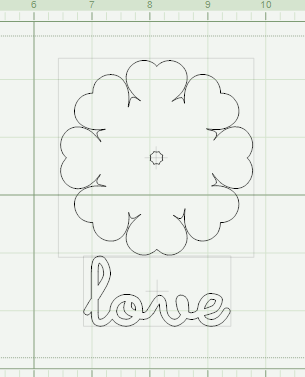 The third mat is the shadow layer of the medallion and the top layer of the word love and is set to preview in red. I could also have included the "love" on the first page of the file which also previews in red since there is nothing else in that area of the mat. 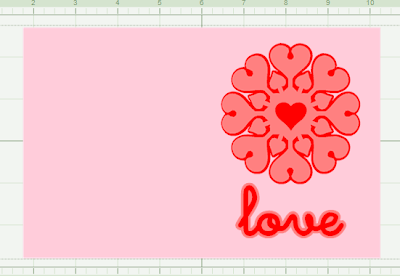 The fourth mat has the shadow layer of the "love" and is set to preview in dark pink. I couldn't include this on the second mat because it would block out the top layer and I would not get an accurate image of the card. The fifth mat is a simple guideline rectangle in the size of an A2 card before folding. (If you have been in one of my Basic Cards classes you will know all about these guidelines!). This page is not to be cut - you would be assembling the card on a piece of 8 1/2 x 11 inch cardstock cut in half and folded in the normal way. I also included another page with a square to help me center the medallion for the preview and the final page is a blank preview page. Once you have your layers all set up, you need to add in the colors. 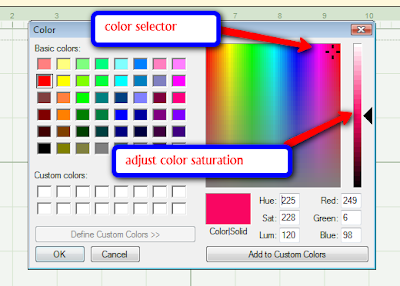 To begin, right click on the mat and select "set preview color" from the drop down menu. There will be a random color for the preview on each page that you will need to change to one that suits you. When you click on the "Set Preview Color" box - this color selection box will pop up. 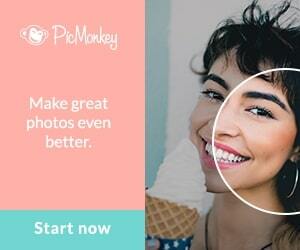 You can quickly choose one of the basic colors here and click OK to change the color. You also have the option to define a custom color by clicking on the "Define Custom Colors" bar. After you click "Define Custom Colors" the window will expand and you can click anywhere in the rainbow box to choose a color and then adjust it with the sliding scale at the right side. You can also set precise values in the Hue/Sat/Lum/Red/Green/Blue boxes. 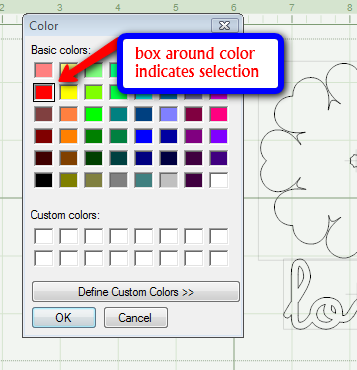 Then click ""Add to Custom Colors" and the color will appear in the Custom colors boxes. Click OK to change the preview color. Unfortunately, the program does not seem to save these custom colors (on the list of things that need fixing...). If you want to duplicate an exact color, you will need to record the values in the six boxes (or you can take a screen shot to help you remember). I usually just work with the basic colors which are generally adequate for a quick plan. However, I did set a custom light pink level for the background card in this file. Ideally, I'd love to be able to add digital representations of the papers I'd be using to preview the card. I can do this by taking a screen shot and importing it into my Creative Memories program which has digital representations of many papers. 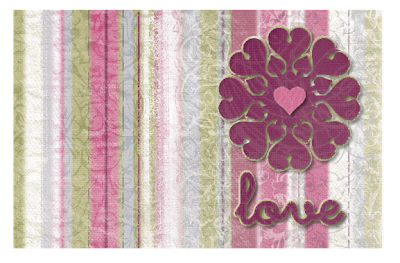 Here is my "paper" version of this card done with Creative Memories "Blush Blooms" digital papers. I have these actual papers so I could use them for cutting the pieces. This conversion process is time consuming and if you have a good "eye" you can visualize your card just by adding colors in tones and intensities that are close to the papers you think you will be using. 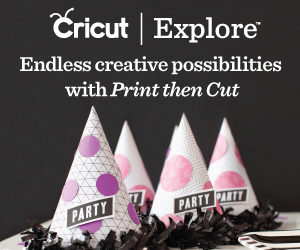 When you have made all of your color choices, you can copy and paste the shapes that need to be cut and set up a mat for each paper you will be using. You will be able to be very efficient in your use of paper by doing this. 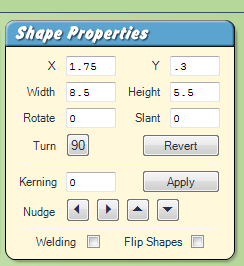 Keep your file with all of the preview mats if you think you might make the card again - it will definitely save you some time! I hope this was helpful - I got so involved in trying to explain things that I ran out of time to actually make a test cut of this simple card(!) I will try to share a finished version of the card soon. 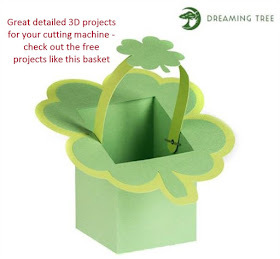 By using Design Studio I know that my sizes will be correct so I will be able to cut once and be ready to assemble my card. I have two or three projects to assemble tomorrow - several need to get out in the mail - so it will be another busy day. Thank you soooo much! I got DS for Christmas and although I haven't really had time to do much with it (other than install it!) I have your blog bookmarked and I just know it is going to help me out a lot. Thanks for th explanation. I really love the design and is looking forward to part two of the project. I know the card will be great. This looks really cool! I have had DS for quite awhile but haven't done much with it. Also got MTC for Christmas and hope to learn how to use that pretty soon! Thanks for sharing your wonderful creations with us! It is very inspiring! Thank you so much. I've had my DS for several months but haven't had the time to figure it out. 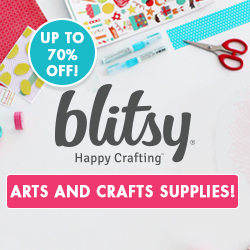 Now that the holidays are over I'm going to spend some time learning how to make pretty projects from you. Thanks so much. 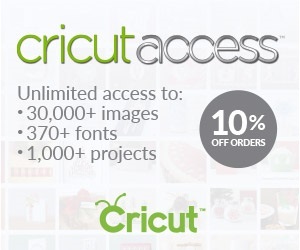 I am new to the Cricut and DS so this is very helpful. Thanx again Dianne for another great tutorial. I need more practice with my DS. Now my DH bought me a Gypsy for Christmas. 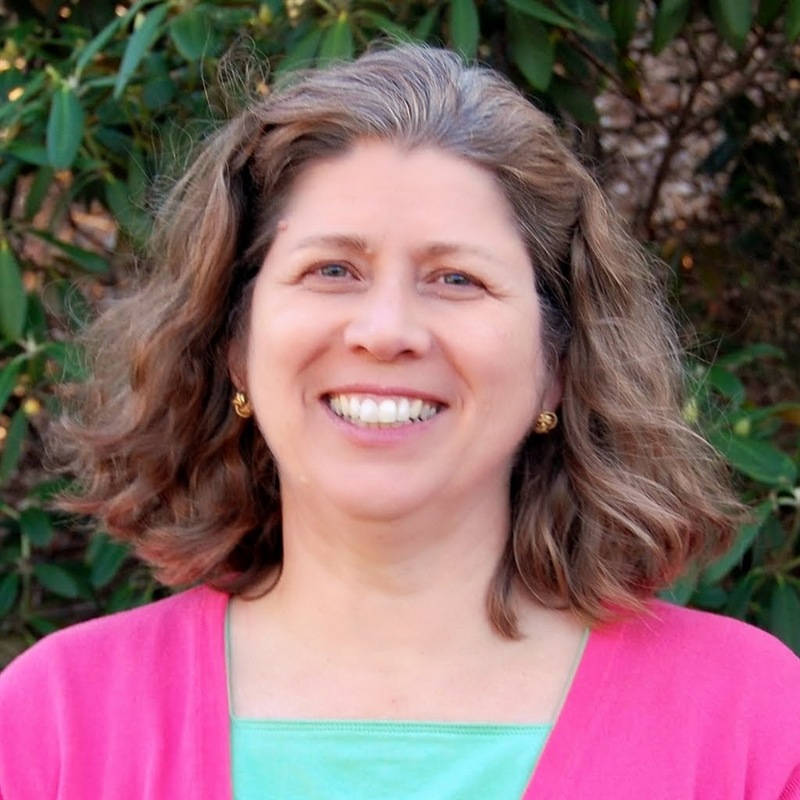 Are you giving any online classes for the Gypsy.? I'd love to take one.